Long Ago,the World We Now Know...Fell.And It Had Fallen Before.And Again and Again.Natural Disasters of Creation Proportions.The Sun Has Risen From East,AND West.Terrible Earth Changing Events,That Not Only Nearly Destroyed Human Kind,But Erased Our Memories.We Were Stronger Then.Taller.And Much More In Tune With What God's (Creation's) Truth Meant.What We Had Learned Was Taken Away In a Blink of Time...And Has Lingered as an Affliction,Since.Global Spiritual Amnesia Was Our Gift.Those Not Protected,Remembered Nothing.You See It Today.It Is How Far Our Society Has Rebuilt Itself.Or...WAS It?What If a Conscious Race Protected Itself Until the Darkness Passed?And What If?...These Beings Are Now,and Have Always Been In Control?We...are 44 and 2,of a Possible,50 and 2. In the Christian Bible, the Being Meta Tron is of the 50 and 2. These are Chromosomes.DNA.In DNA,Lives the Word YAH...God.Christ Consciousness Is Not About a Man,Sent By God.It Is About a Man...Using His Life,to Ascend.To Enrich.To Grow.To Evolve,and Become Greater,For the Future.For the One's He Loves.And,In That Beginning Motivating Moment...Love...MUST Exist,as It Will,In the Final Moment.For,After All...Love...Is Our One True Freedom.In the Galactic School That Is Earth...There Are Interests That Would Love For You To Sleep.Ask Yourself...Why? Nice Looking man,love the long hair and also the facial features. 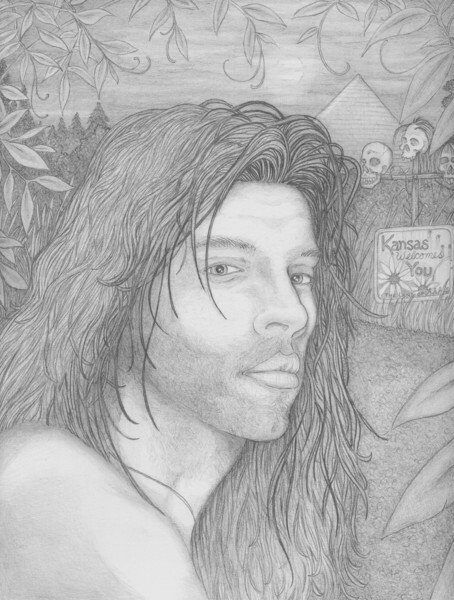 men are a rare sight in your portfolio..this one makes a grand appearance..brilliant rendering of hair, skin tone and foliage..a graphite masterpiece. in every sense of the word. gorgeous work,superb personnage,great drawing,wonderfully done! You make your men even more sensual than your women...if that is possible..